Have you ever heard a well-known Bible story and felt as though you were hearing it for the first time? 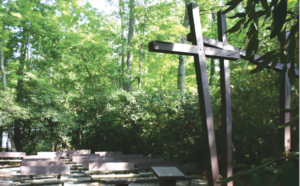 Or led worship for 30, 50, or 100 of your peers in the most beautiful outdoor chapel you could ever imagine? Or had your faith shaped more than you could possibly imagine by a week with kids? If you answered yes to any or all of these, chance are you’ve been to church camp. Church camp is one of the most meaningful and important ways to develop and deepen the faith of kids, youth, and adults. It’s also a great way for our regions to stay connected as people from all over the region come together to grow in faith, love, and community. Attending church camp is one of the most formative faith experiences for children and youth. Christmount has launched the Camp Matters Permanent Fund starting with the “I’m in for Ten!” Campaign. With this campaign, we’re asking you to give $10. Half of your donation will go towards the Camp Matters Permanent Fund, and half will go directly to the DOC Camp and Conference Center of your choice. Once the Fund reaches $50,000, Christmount will begin accepting applications from DOC Camp & Conference Centers to receive small grants to help with projects, property, or personnel. Thank you for joining us in building camp and conference ministries for all Disciples. We want everyone to know #CampMatters! For more information or to join the “I’m in for Ten” Campaign, visit christmount.org/campmatters.